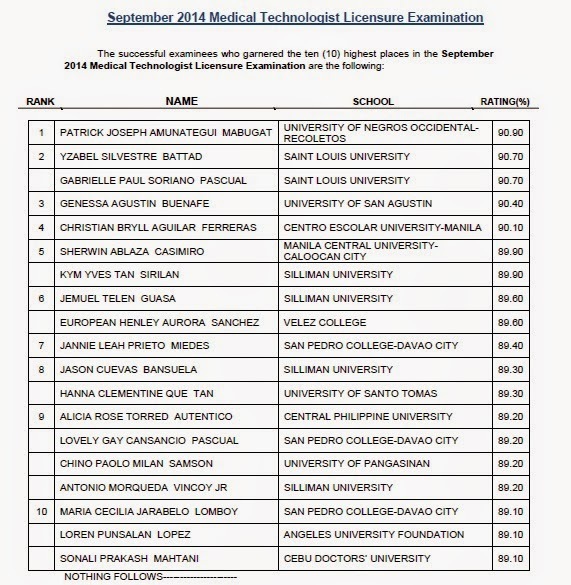 The Professional Regulation Commission (PRC) on Wednesday released the complete list of passers for September 2014 Medical Technologist (MedTech) board exam. Patrick Joseph Amunategui Mabugat of University of Negros Occidental Recoletos (UNO-R) topped the board with 90.90 percent grade. Yzabel Silvestre Battad and Gabrielle Paul Soriano Pascual of Saint Louis University (SLU) ranked second with identical 90.70 percent grade.